The Australian Rugby Union has made its fair share of dud calls over the past decade but signing Quade Cooper to the Sevens program certainly isn't among them. Cooper had made no secret of his desire to represent Australia at the Olympics, but the ARU's ability to get the deal done in conjunction with world rugby's most enigmatic of characters, Toulon owner Mourad Boudjellal, is itself an accomplishment. Whether Cooper is able to learn the intricacies of Sevens from three HSBC World Series events - he will feature in Sydney, Paris and London -- remains to be seen. But there is absolutely no doubt that the Sydney leg of the series, Quade's first outing, now has the star power it needs to be a truly massive event. 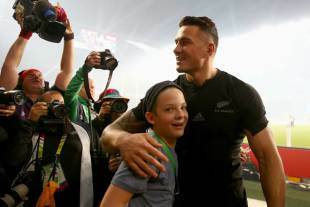 While Cooper was always rumoured to be appearing in Sydney, Friday's confirmation will likely see the 2500 tickets that remain snapped up faster than you can say Sonny Bill Williams. And speaking of the All Blacks superstar, his inclusion in New Zealand's squad for the Allianz Stadium event would be the absolute icing on the cake. Williams is tipped to make his Sevens debut in next weekend's leg in Wellington, having trained as part of Gordon Tietjens' squad for the past few weeks. Like Cooper in Sydney, Williams will give the Wellington stop the star billing it needs to drive fans through the gate. The Westpac Stadium event has struggled for spectators in recent years, after proving hugely popular in its infancy; the NRL's Auckland Nines is seemingly the two-day party of choice in New Zealand. Wellington has endured similar issues to the Gold Coast, where the party atmosphere of Sevens seemed to be a natural fit; but after four years of mediocre crowd figures on the sunshine strip, Sydney was anointed as the shortened form's new home in Australia - perfectly fitting World Rugby's wish for the World Series to be hosted by the "iconic" cities across the globe. Now just a fortnight away, the two days at Allianz Stadium will go close to topping the Gold Coast's total attendance figures from the four years it hosted the event. A sell-out crowd would certainly continue the current warm glow for Australian rugby that emanated from the Wallabies' surprising run to the Rugby World Cup final. Michael Cheika's side played with pride and determination in an inspiring five-week run at Twickenham, only to fall to the All Blacks at the final hurdle. The ARU then scored itself a fine Christmas present in unveiling a new five-year $Aus285 million broadcast deal that represented a 148 per cent improvement on its previous figure. The Sydney Sevens provides the ARU with a wonderful opportunity to continue what has arguably been the rosiest period for rugby in Australia since the 2003 World Cup. The event will have clean air in Sydney with no rugby league or AFL offering an alternative. The Auckland Nines are on the same weekend, which will likely affect the television broadcast numbers, but in terms of Sydney spectators there is just one ticket - or around 2500 to be precise - in town. Quade's confirmation may have been a long time coming, but the announcement on Friday will only help to drive anticipation over the next fortnight. All Cooper needs now is a crash course in Sevens play and that, unlike a full Allianz Stadium, may be easier said than done. Extraordinary triumph or miserable fail - it'll be worth watching either way.